Japanese Alexa Commands: Arekusa, Speak Nihongo! Did you know you can set your Alexa device to answer in Japanese? Same thing with Siri and other AI assistants. While I am certain these commands work for other devices, let’s look at Alexa specifically. 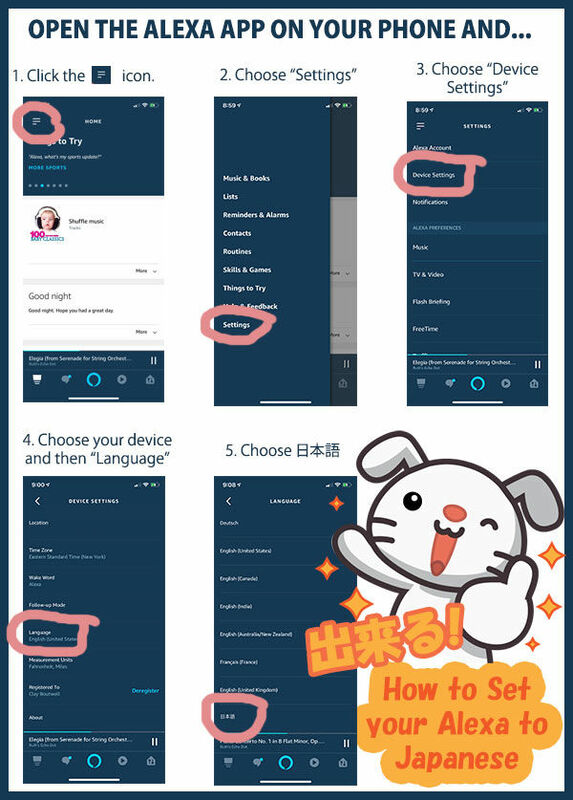 If you have a newer Alexa device, you should be able to set it to Japanese using your Alexa App. First generation Echos do not support Japanese, unfortunately. 「何時ですか？」 nanji desu ka? What time is it? 「今日の天気は？」 kyou no tenki wa? What is today’s weather like? 「天気」 tenki (Short version) Weather. 「今日は雨降る？」 kyou wa ame furu? Will it rain today? 「週末の天気は？」 shuumatsu no tenki wa? How is the weather for the weekend? 「今週の天気は？」 konshuu no tenki wa? How is the weather for this week? 「続きから再生して」 tsuzuki kara saisei shite. Resume. 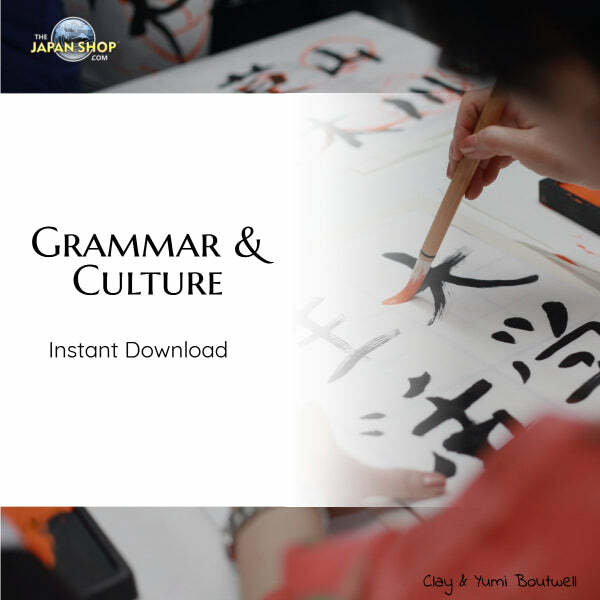 「音量を上げて」 onryou o agete [or you can use ボリューム boryu-mu (volume) instead of onryou] Turn up the volume. 「音量を下げて」 onryou o sagete [or you can use ボリューム boryu-mu (volume) instead of onryou] Turn down the volume. 「次の曲」 tsugi no kyoku. Next song. 「この曲をリピートして」 kono kyoku o ripi-to shite. Repeat this song. 「この曲何？」 kono kyoku nani? What is this song? 「午前7時にアラームをセットして」 gozen shichiji ni ara-mu o setto shite. Set an alarm for 7 AM. 「10分間のタイマーをセットして」 no taima- o setto shite. Set a timer for 10 minutes. 「セットされているアラームを教えて」 setto sareteiru ara-mu o oshiete. What alarms are set? 「30分後に起こして」 sanjuppun go ni okoshite. Wake me in 30 minutes (sets a timer). Just as you would in English, ask Alexa trivia, like how tall is Mt. Fuji or Who invented the light bulb. 「空はどうして青いの？」 sora wa doushite aoi no? Why is the sky blue? Plus: 「1たす１は？」 ichi tasu ichi wa? What is 1 + 1? Minus: 「１ひく１は？」 ichi hiku ichi wa? What is 1 – 1? Multiplication: 「１かける１は？」 ichi kakeru ichi wa? What is 1 x 1? Division: 「１わる１は？」 ichi waru ichi wa? What is 1 / 1? 「今日のニュースは？」 kyou no nyu-su wa? What is today’s news? To get Japanese news, you’ll need to find and enable the country/ language specific skill in the app and then add it to your briefing. 「歌を歌って」 uta o utatte. Sing a song. 「動物の鳴きまねをして」 doubutsu no nakimane o shite. Make animal noises. 「なぞなぞ出して」 nazo nazo dashite. Give me a riddle. 「ジョークを言って」 jo-ku o itte. Tell a joke. 「好きな四字熟語は？」 sukina yojijukugo wa? What is a 4 character kanji combination that you like?